Conference is held in Bratislava on November 6-7th 2017 in co-operation with UNIDO and Ministry of Economics of Slovak Republic. Partners of the event are Automotive Industry Association of the Slovak Republic, Embassy of Netherlands in Slovak Republic and Royal Norwegian Embassy in Slovak Republic. INCIEN is a partner in Zero Waste concept of the event. During the year, Ministry of Environment of Slovak Republic is organising a great number of events for different target groups or experts in field of environmental development and protection. Next event’s topic is circular economy in automotive industry. Organisers of the event have decided that beside the high quality of the event, waste prevention will be a one of its priorities. Circular economy is about design, responsible consumption and waste prevention, so it is very logical that these events should present the sustainability solutions also in smaller scales like events. It is becoming very common that events with circular economy topics are organised in sustainable way and sustainability is a priority during these events not just as a topic to be discussed. Organizer of the event has a very important role in Zero Waste concept, because this decision is starting the whole concept. It is not easy and to find a place that will offer good quality of services but also sustainable solutions and the event without a great number of single used items that will become waste right after the event ends (or even before). This is the reason why the place where the event will be held is so important. 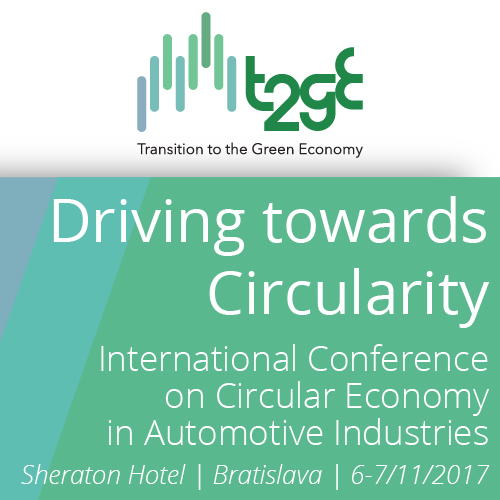 Conference for circular economy in automotive industry will be held in Sheraton hotel in Bratislava. This hotel will welcome around 170 experts from around the world in one place for two days. What can come as a surprise to all is that a hotel of this scale which is a member of a great hotel chain offers the sustainable services. Sheraton is one of the few hotels which offers Sustainable Meeting Practices. As a first step Ministry of Environment applied the Rethink’s rule, where they have also selected the place that already has a Green Policy. After Rethink, we applied additional conditions for Zero waste event – 5R. 5 Basic Zero Waste rules: Refuse-Reduce-Reuse-Recycle-Rot. • Potential food waste in the kitchen will be composted or processed in a kitchen bio waste treatment machine. During the whole event, we will monitor the results of Zero Waste concept.